Location: Ambérieux-en-Dombes, in the Ain departement of France (Rhone-Alpes Region). Notes: Château d'Ambérieux-en-Dombes is a former castle, founded in the twelfth century by the Sires de Villars, and rebuilt in the fourteenth century, which stands on the town of Ambérieux-en-Dombes in the department of Ain region Auvergne-Rhône-Alpes. The castle was the center of the Lordship of Ambérieux and the county seat of a lordship of the principality of Dombes.The three towers of the castle are the subject of a classification as historical monuments by decree of June 21, 1905.Tradition has it that the castle of Ambérieux was one of the favorite residences of the first Burgundian kings and perhaps instead of a palace Gondebaud The castle is in the twelfth century possession of Villars and passes sires, like all their lands to the Thoire-Villars family. The present castle was built between 1370 and 1376 (dendrochronology study), under Humbert V Thoire-Villars. It is taken in 1408 by Amé Viry, er resumed shortly after by John Chateaumorand, who passed to the sword Savoy garrison.The ruins of the castle has three towers, a dungeon and the remains of a chapel. Of the three towers, two are square base and the last circular base of small diameter, used as a prison. 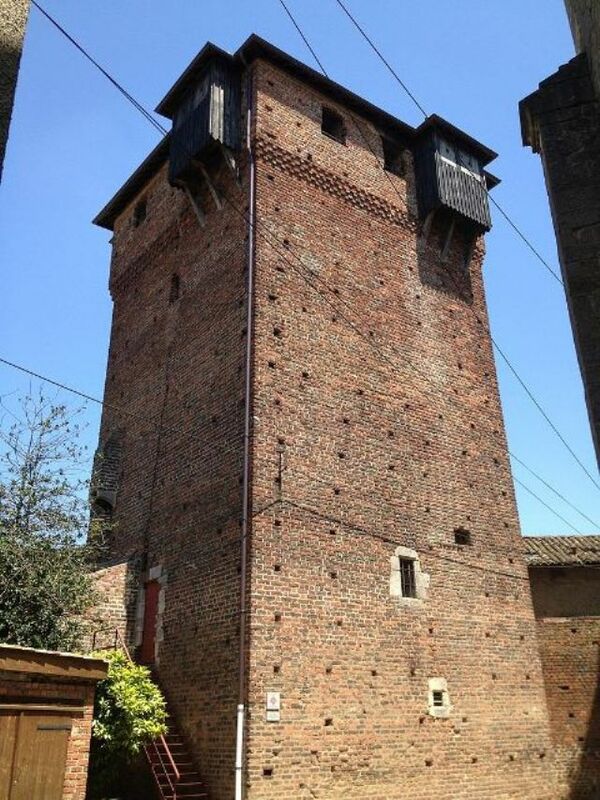 The dungeon, square, built in brick, measuring 19 meters high, dates from the twelfth century. The enclosure of the fourteenth and fifteenth centuries, it remains primarily a round tower and the house of debris that were re-employed. The castle has undergone a complete restoration with the installation of a new roof in 2010.